Gotta say, I reckon I flaked a bit this month. 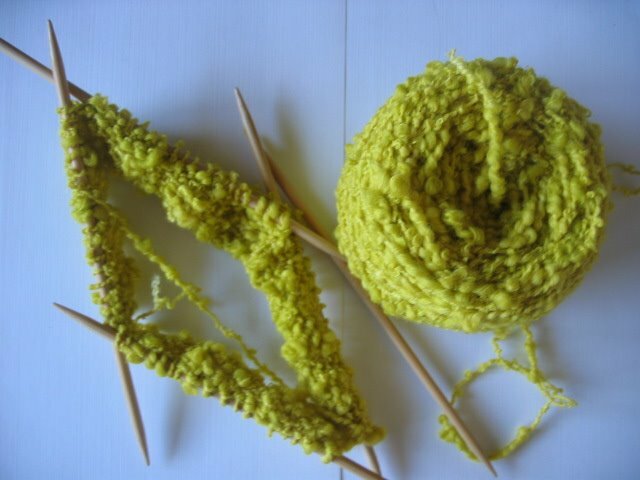 After attempting to make something from that yellow boucle, I seemed to lose my way a bit. Project Spectrum is supposed to be a no pressure thang, so why do I get so tangled up? Then it dawned on me. I keep seeing each month as a colour, whereas I should be thinking colours... get me? It's the notion of flat colour versus tonal colour. Flat stops me in my tracks... yet tonal stuff I fly with. This realisation occured when I remembered how I used to paint. Now, I didn't train in painting, Textiles was always my passion... yet there was a phase of throwing acrylic at canvas a few years back, with questionable success. It started as an excercise of getting emotion into colour & texture, and went on to be a useful cathartic tool for some while. So I dug out some old photographs. Orange and red tones, as we know, are a pig to pick up on a digital camera, yet hopefully this one demonstrates what I'm on about. Titled 'Three Entities', this was the first painting that launched the experimentation. It looks much more effective in real life, even though it isn't a huge canvas. Having realised this, that if I stop trying to think of just one colour, the creativity loosened up and started to flow again. Sadly, this only happened a few days ago, and we're already into May, which means the end of orange & yellow, and the start of green. Still, a couple of orangey fibrey creations have developed. Firstly, this hat... crocheted in DC (SC to those from the US) and was worked in stripes of orange and red. It's been named the 'Mushroom Cap' and the pattern is already written in note form. Infact, a 2nd sample hat is nearly finished in shades of green. I really like it's simplicity; back to that business of simple shapes and forms, allowing the colour and texture to take centre stage.... a style of working that seems to be my strength. My heads all in a tizz, what with trying to plan for the truck, trying to organise my online store, Etsy and galleries, working out how exactly to sell and shift all the futniture, videos and junk that we won't be taking with us, day dreaming about the imminent arrival of my Hitch-Hiker (the 1st to the UK, I'm told) and how I'm going to personalise it.... so much to do!